The debate boils down to: Are the terms to which Pres Santos and the FARC leadership agreeing an acceptable price to pay for peace—aimed to save lives, open Colombia to greater development and prosperity for a wider range of its population, expand democratic participation, fortify the Constitution and institutionality, and contribute to national/international security—as Pres. Santos, the FARC and other peace-process supporters argue? Or, as Uribe argues, would it eventually result in the fuelling of future (perhaps worse) violence, greater drug-trafficking and other crime, and threaten Colombia’s Constitution and institutionality, not only to the detriment of Colombia, but also to that of the international community, because it would tinker supposedly harmfully with Colombia’s Constitutional and institutional balance and would allow those who confess involvement in grave war crimes or with illegal drugs-crops to not go to jail, and thus it would supposedly perhaps be an incentive for present and future outlawed groups to grow their strength to try to get similar judicial benefits? 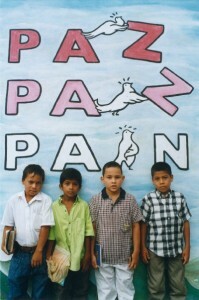 Going from bottom to top, the words appear to read (if inadvertently): “pain” in English to “paz” (“peace” in Spanish). Or read from top to bottom, it could be seen as “paz” to “pain.” Colombians will decide how their future unfolds. © Photo by Steve Salisbury. All rights reserved. That is for Colombians to decide; they have to forge their own destiny, even though the international community can try to help and does help with some things.